Before the website went live there was a spirited debate between, shall we say, the older members of the ROA and the young upstarts as to what was the correct braid that a smart R/O should be seen in. Your esteemed treasurer, J. Garner Esq., was solidly in the wavy braid camp, whereas I, T. Selman Esq., was firmly in the solid braid camp. This is obviously a generational thing although many of our members span both eras. So let’s get the debate going and as a starter for ten the attached image was taken from a Marconi Mariner of 1964 and shows the braid for their personnel. In the spirit of fair play both braids are shown in the Forum header area. « Does your uniform still fit? In P&O we seemed different to all the other outfits. The braid was worn on the shoulder – but not as boards. More reminiscent of Yankee cavalry officers of the Civil War era ! on my first three single-operator vessels. Hi Roger. A mutual friend of ours, your namesake Don Chapman, would like to contact you. His email address is [email protected] and he lives in Canada. No, stewards went up and down in tandem, and no diamond, yes they were on white., totally different to the PROPER braid. In New Zealand Shipping/ Federal Steam Nav.Co. we were direct employed and the Co. style was to have braid on the shoulder for winter uniforms and, of course, as epaulettes on both whites and mess kit. Wavy, of course; two lines for lower orders and two lines with central diamond for the boss. Doing a bit of browsing here – but interesting. NZSCo wavy braid? Green? Back in the day (early sixties) NZSCo was straight braid with blue. Green was for leckies. Chief on passengers were three stripes, on cargo two stripes. Always on the shoulder. Excellent web site, great work and well done. I have to say that I am of the wavy brigade, why would I have wanted to look like an electrician? The B.P. Tanker Co. Sparky braid was wavy with a loop much like the Wavy Navy or Royal Navy Volunteer Reserve braid. One ring & loop for Junior Sparks and 2 rings & loop for Senior Sparks….one did not rise higher than that! I have recently been on several cruises with ‘Maritime Memories’ http://www.maritime-memories.co.uk/ a small group of ‘Ancient Marineers’ who cruise on board the M.V. Discovery and attempt to relive some of their past! On formal evenings We are allowed to dress up in our old uniforms ( or those bits that still fit!) some, or should I say, most of us cheat however! The only original bits of mine that fit are the shoulder boards which reside on a new mess jacket!…Great fun and we have dinner menus recreated from some of the shipping companies of the past. I have been asked several times if I was in the Wavy Navy because of the wavy braid. Wonder if any others of the wavy braid brigade have had similar recognition problems in the past? Recognition. 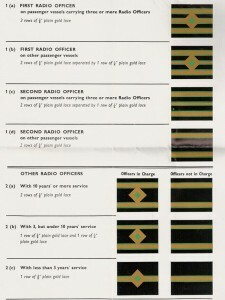 No matter what ship or people from crew to pilots etc everybody knew the “sparks” braid ( that is the proper wavey one). No need to issue a colour code to see if you were a “leckey” or something else. Also only 3 different braids, much cheaper, obviousley MIMC were getting a cumshaw from the naval outfitters .